I developed these spreadsheets for my own entertainment. They are not intended for any commercial use. The first spreadsheet, LinearRAdec, uses the linear approximation described in the book. The second spreadsheet, RAdecfinder, is the full calculation. I almost always use this one. The input data for both is very similar. There are three numbers that almost never change. Two are the x- and y-coordinates of the center of the photograph, in pixels. In the spreadsheets you will need to flip these around if you change from a landscape orientation to a portrait orientation. The third number is called a scale factor. It is the linear size of a pixel in your camera, divided by the focal length of the lens. For the full spreadsheet this should be as accurate as possible. For the linear approximation version the scale factor is in principle arbitrary. This is an advantage if you haven’t calibrated your lens carefully. The other input values consist of three lines for the three stars you have selected. For each star the input numbers are the x- and y- pixel coordinates on the photograph, measured from the top left-hand corner of the photograph, three numbers for right ascension in hours, minutes, and seconds, and three numbers for the declination in degrees, minutes, and seconds. The next line contains the pixel coordinates for the object to be located. I like to record the names of the stars and the object with the data, just to have them available later. Both of the spreadsheets contain input numbers for a particular example, Mars photographed on 5/20/2016. This is the star-field photograph of Mars. It is typical of the more than a thousand that I have analyzed. 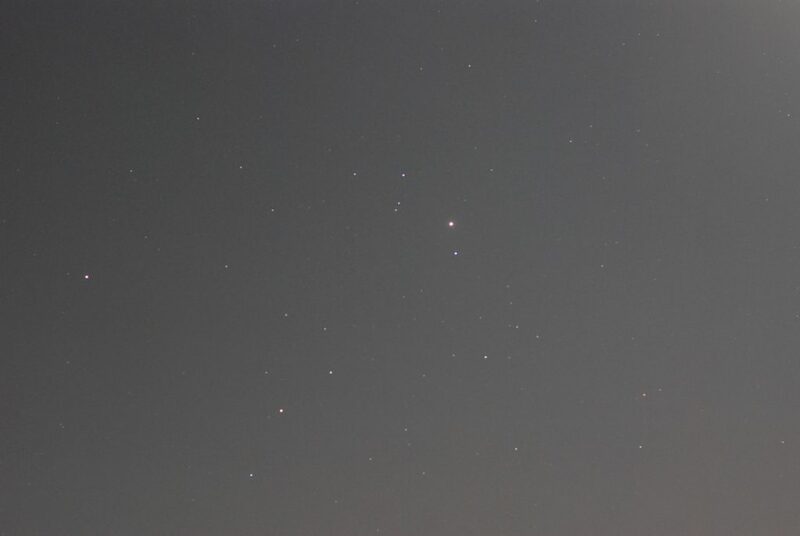 Mars is near the center. By chance, Saturn is also in the view, on the left side. A small change was made to both spreadsheets on 5/10/2017. You probably won’t notice the difference but, if you downloaded the earlier versions you should upgrade them.